It may be Swine Flu. I certainly hope not. More likely it’s whatever cold was going around LeakyCon last weekend, where Maureen Johnson got sick, and then was kind enough to share her germs with me. But I head home from NYC tomorrow, and once I get back to Denver, all I can think about is the time to lie in bed and read. I know several of my clients are eager to hear my thoughts on their revisions — and I’m eager to read their manuscripts, so it all works out! So, if you were bedridden for a few days, or could be, what would you do? And if you say “read,” do you want to read new stuff, or pull out an old standard? Well, assuming husband whisked away the children so I could be at peace while bedridden, I'd SLEEP. Hah. But then I'd be tired of sleeping, so yes, read. Probably new stuff, but a few oldies I haven't had a chance to read yet. And movies. I love movies. And, well, writing of course. I would be a multi-tasking bedridden person. Enjoy your reads! When I'm sick? Old standards definitely! And I read a lot of fantasy and fairy tales when I don't feel well. Hope you feel better soon! Sending very powerful chicken soup your way. Last time I had food poisoning, I recall reading lots of Babysitters Club books. It was exactly what I needed. I turn to the comfort reading of my childhood–Noel Streatfeild books. I'm all about the comfort reads and a little BBC Pride and Prejudice action. Or maybe Grease 2. Cannot believe I mentioned those two movies in the same comment, but it's still true. My guilty pleasure when I'm bedridden is watching all three Shrek movies. No matter how sick I am, those movies ALWAYS make me feel better. They're just happy. And when you're sick, you need happy. Well, I'd read new stuff seeing as I have a stack of books waiting to be read–and I just keep buying more. Right now, the lineup includes, The Graveyard Book, Graceling, Pretties, and the 2nd and 3rd in the Night Huntress series. Then, when I would need a break from the reading, I'd suggle up with my laptop and log onto Hulu to catch up on some of my TV shows…Bones, Dollhouse, The Office, 30 Rock and for the hell of it, I'd watch some of my fav episodes of Buffy. Unfortunately, Hulu only has season one of Angel. 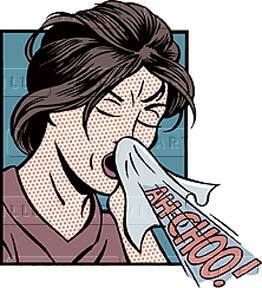 Oh, gosh, being sick sounds wonderful…except I don't get sick days from my kids. Ah well. I'm with you though–sleeping and reading. I'm sick too! Got a really bad sore throat last week Monday after a week in Oahu, was in terrible shape with a bad head cold by Thursday and Friday but had to work — my one backup was on vacation — rested over the weekend, took off sick on Monday, started to feel better yesterday and worked again, then fell right back sick again today. Uggg. I don't think it's the swine flu because, even though I've had a slight temperature, I haven't had the really high fever I've read is associated with swine flu. But I can tell you, there's a REALLY bad cold strain going around. Avoid it if you can. Start chewing vitamin C tablets now! As for what to do when I'm sick, I've been running through a bunch of books, new ones that have been on my want to read list. I just finished The Graveyard Book and then the third book in the Percy Jackson series. Next up I'm going to read my first adult book since I started writing children's books, Carrie Fisher's Wishful Drinking, on a recommendation from my husband. Then back to my kids pile with The Great Ghost Rescue, which I found in a used book story and had me laughing on the first page. TV and movies are also good when I'm sick and I've been watching some old Stargate SG-1 episodes on Sling.com. Hope you're feeling bettere soon, Kate. Rest and plenty of fluids. Carrie – I LOVE Grease 2! I thought I was the only one. For myself, I would read my good ol' favorites (Lady of the Light, and The Light Bearer, respectively) if I hadn't loaned them to my MIL. Instead I'd finish the series I'm currenly working on and stay away from editing. I've tried editing sick before – that is bad news. So maybe some movies or horrible horrible E-News/HGTV shows that are my guilty pleasures.